I've been shopping for new furniture recently, so I've been paying extra attention to furniture ads on TV. You can imagine how excited I got when I saw that Rooms To Go is selling NFL and NCAA bedroom furniture for Kids & Teens. It makes me wish I had a little boy or girl's room to decorate! If you're thinking about redoing your little sports fan's bedroom or playroom, I highly recommend checking out Rooms To Go. The full collections are listed under "Boys' Rooms" on their website (ahem, girls like sports, too!) and some pieces are adorned with select NFL and college team logos. 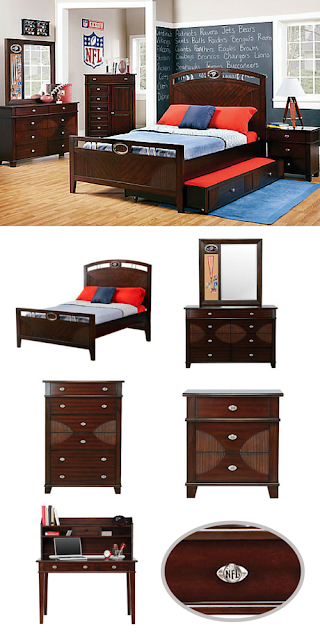 I especially love thoughtful details like the subtle football design on the drawers and the NFL football drawer pulls! Plus, these sets have a classic look and feel, so they can grow with kids through childhood and well into their teen years. 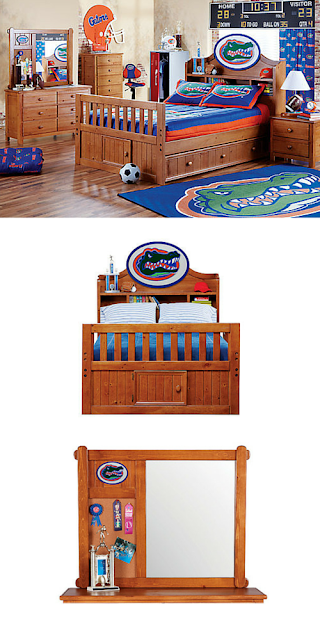 What do you think of Rooms To Go's NFL and NCAA kids furniture?